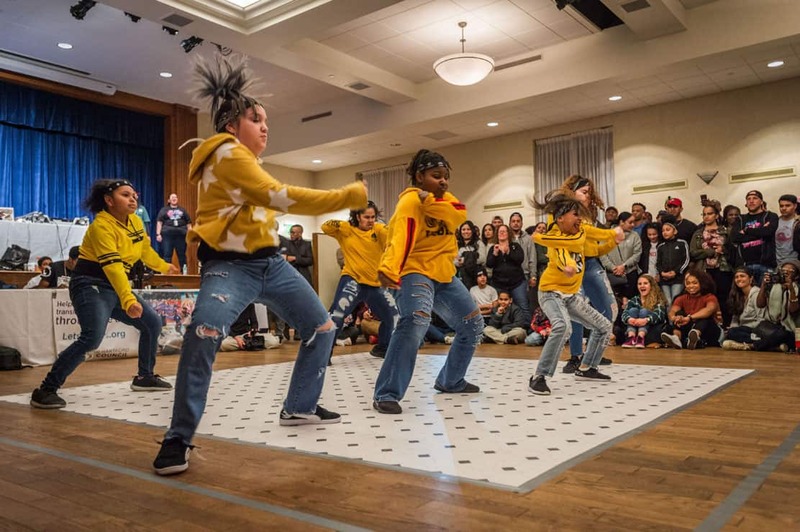 Hartford, Connecticut, April 11, 2019 – Peace, Love, Unity, and Safely Having Fun is the motto of the annual Trinity International Hip Hop Festival. 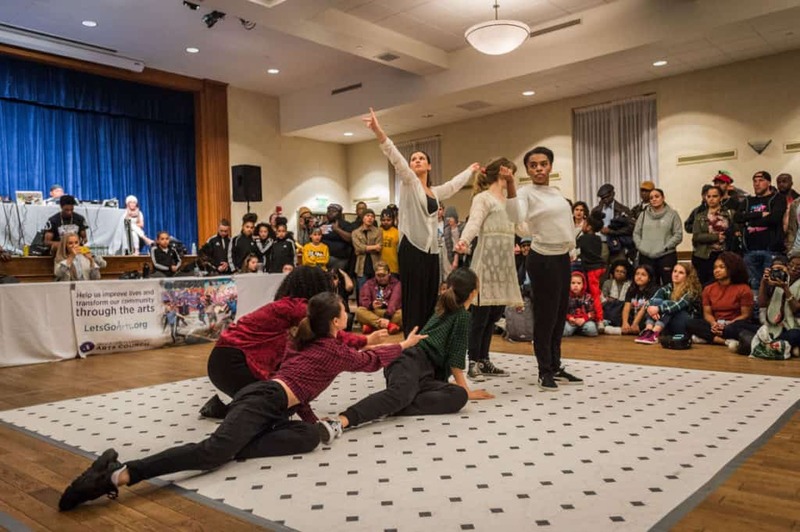 The 14th installment took place the weekend of March 28 through 31, bringing together artists, educators, scholars, organizers, students, alumni, and fans from around the world. 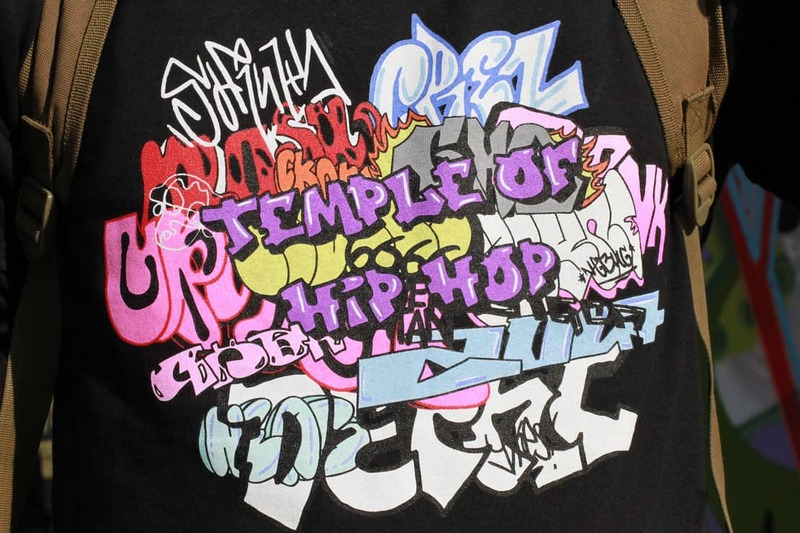 To this day, it remains the biggest and longest-running festival of its kind hosted by a U.S. college or university, due in large part to the work and dedication of the Trinity Chapter of Temple of Hip Hop. On Thursday, March 28, hip hop activist Harry Allen (a.k.a. “the Media Assassin”) kicked off the festival with a riveting photograph-centric lecture on his personal relationships with members of the legendary hip hop group, Public Enemy, during the 1980s. It was a lecture that addressed artistic self-determination, colleges as early incubation spaces for hip hop music, and the history of beat production technology. More than 50 people were in attendance, including 20 high school students from the Hartford Magnet Trinity College Academy. Later in the evening was the Iron Poets Opening & Open Mic, with special guest performances from the percussionist duo Puertominicana (Hartford) and spoken word artist Deneka Thomas (Trinidad & Tobago). On Friday, March 29, a series of lectures and panels were held in the afternoon. 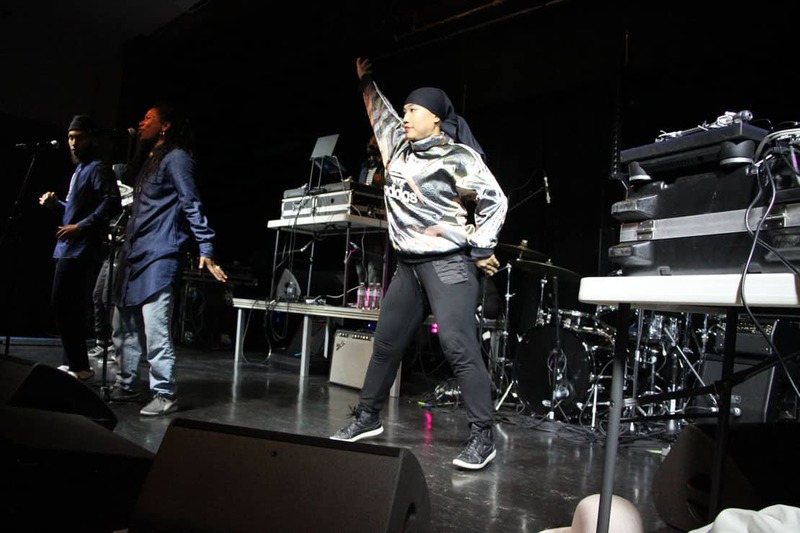 The Jamaican hip hop trio, The Council, presented on hip hop’s origins and growth in the Caribbean. 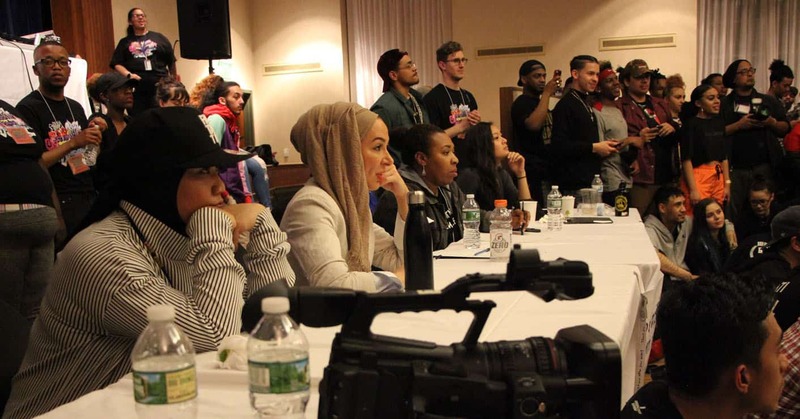 This was followed up by a panel discussion titled “Listening While Muslim: Islam’s Impact on Hip Hop Music and Culture,” with Amirah Sackett, B-Girl Ma-Ma, and The ReMINDers, moderated by DJ Man-O-Wax and Abdul-Rehman Malik (Yale University lecturer). One Trinity student who attended the panel noted: “It showed that you can’t put Muslims in a box or in one single category. I liked how the panelists were vulnerable. 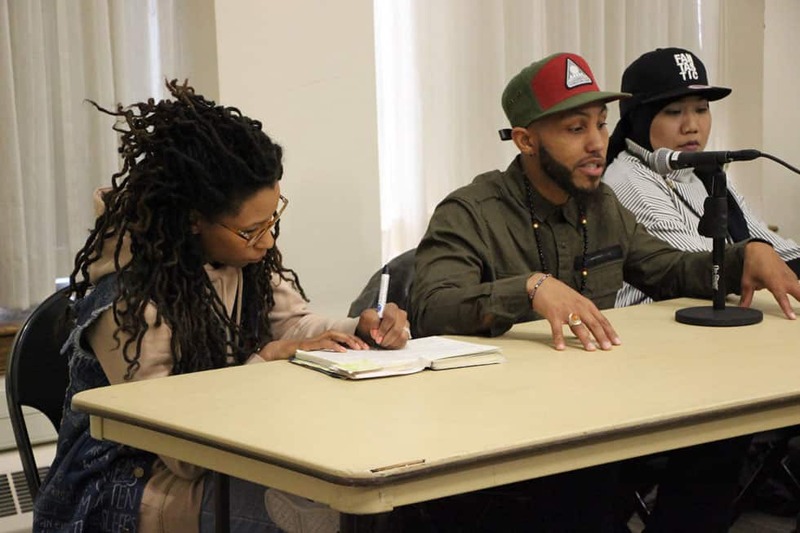 They shared really personal stories of conversion and faith.” Afterward, Hartford’s Lee Mixashawn Rozie IDP ’12 lectured on the similarities between indigenous music and hip hop music to close out the academic events for that day. Students from Trinity College and HMTCA perform a dance choreographed by Amirah Sackett. Photo by Eric Zhang ’22. 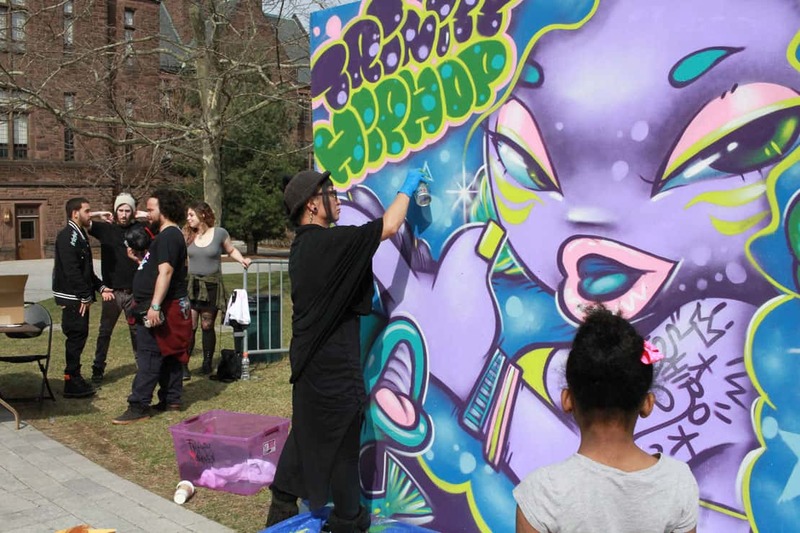 On Saturday, March 30, held outdoors on Gates Quad on the warmest day of the year thus far was a live graffiti exhibition featuring Japanese artist Shiro One, along with Hartford artists Lindaluz Carrillo, Wiley, Mr. Massey, Suby, Tuesday, and Machinegun Poptart. 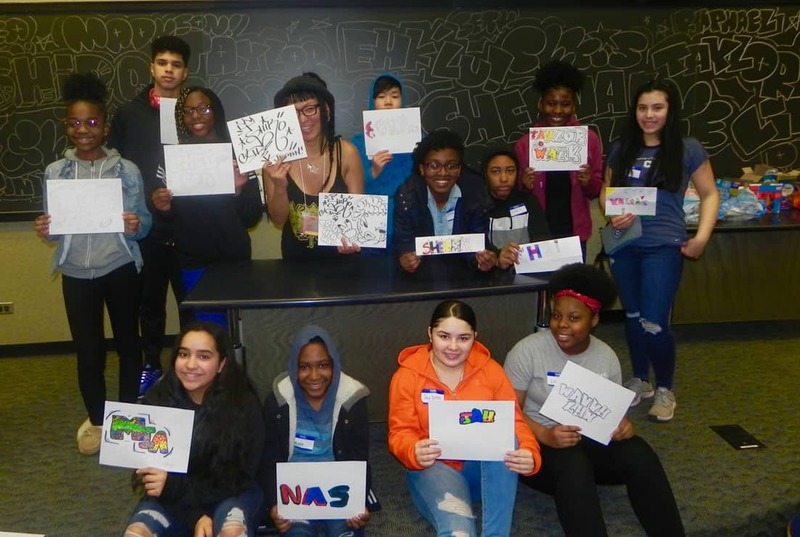 While the graffiti writers were showcasing their spray-painting talents, 60 Hartford Youth Scholars, ages 13-18, were participating in the festival’s annual Youth 4 Change Conference. The conference consisted of a series of workshops on song writing, breakin’ and poppin’, beat making, tagging, debating, hip hop as a political mobilizing tool facilitated by Aja Black and Samir X of the ReMINDers (Denver), Amirah Sackett (Chicago), B-Girl Ma-Ma (Detroit), DJ Man O Wax (Hawaii), Shiro One (Japan), Kala (NYC) and Project South (Atlanta), respectively. 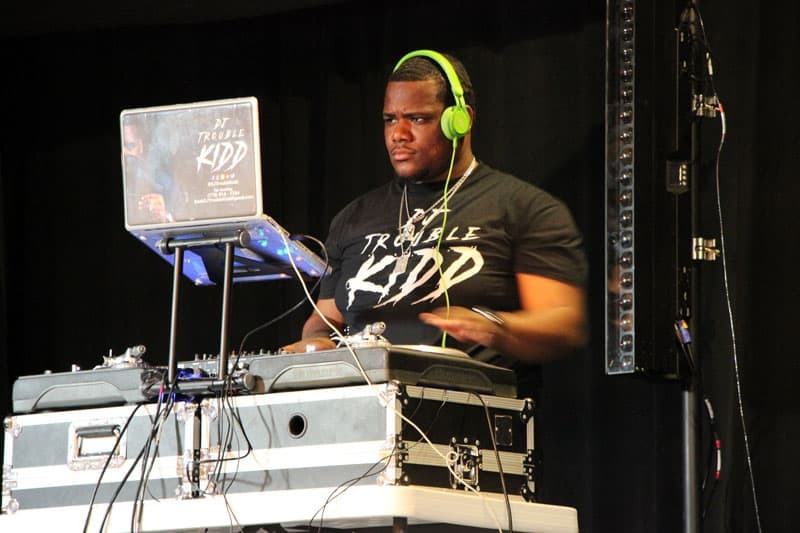 Immediately following the Y4C workshops were a slew of performances by DJ Trouble Kidd (Jervon Adams Jr. ’20), Studio 860 Junior Company, and 10 youth representing organizations such as Hartford Youth Media. Also on Saturday was the Favorites Showcase, formerly the Cave Patio Showcase. Hosted by Self Suffice (Hartford), who was joined by DJ Trouble Kidd, this event started out with a handful of special guest performances. 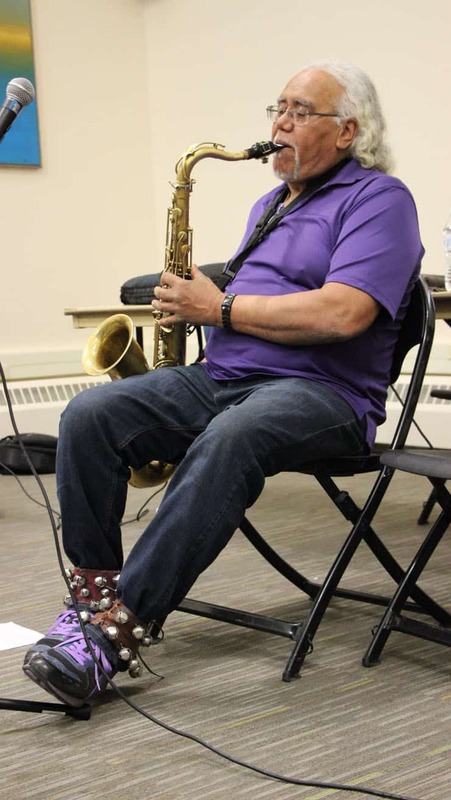 Lee Mixashawn Rozie IDP ’12 displayed an uncanny mastery of circular breathing while playing the saxophone. Protigee, last year’s winner, gave a preview of his main stage performance later in the night. Dilson Hernandez (NYC) of Peoples Music Network performed a few powerful and well-received poems about the diaspora, Afro-Latinx struggle, and indigenous Americans. Other special guests included DJ Pup, The ReMINDers, and Minister Server (an adviser to the Trinity Chapter of Temple of Hip Hop). 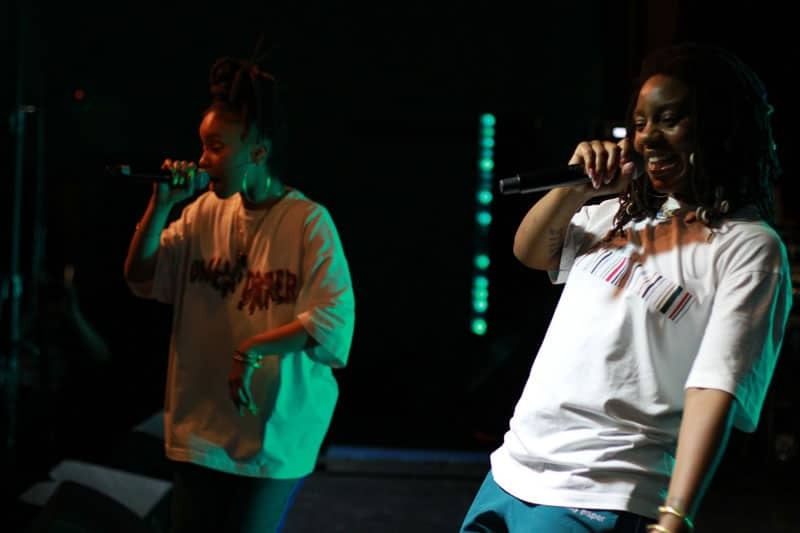 The contestants who competed to perform at next year’s festival included GQ, Prynce Eli, Preme Alom, Blessings, Divine, Ty Hook, Williano, K8Toe, King Aether, J Haze, J-Finesse, G Smit, Rell Sonatra, and Mike Bhaiya. The winner will be announced in September 2019. Other notable Saturday events included a film screening and Q+A about the history of hip hop in London and a conversation between artist Akua Naru (Ghana/CT) and Professor Clifton Watson (Wesleyan University). Naru talked about her life as an artist, her music and how it evolved through traveling to over 50 countries, and the kinds of messages she incorporates into her music. On Saturday night, more than 300 people attended the Main Concert hosted by Versatile Poetic (Hartford) and Social Justis (Manchester, CT/NYC) along with DJ Boo (Philippines/NYC). DJ Trouble Kidd, Protigee (Hartford), Phat A$tronaut (CT), The Council (Jamaica), The ReMINDers and Ma-Ma² with DJ Man-O-Wax (USA), and Keur Gui and the Waliyanne Band (Senegal) hyped up the crowd before NYC’s OSHUN took to the stage to deliver a memorable headlining performance. Sadly, Hustlajay MauMau of Kenya could not perform due to visa issues, but this allowed for two epic freestyle sessions where more than 10 MCs graced the stage at different times throughout the night. On the final day of the festival, Sunday, March 31, activities moved from Mather Hall to Vernon Social and the Unique Hair Salon. 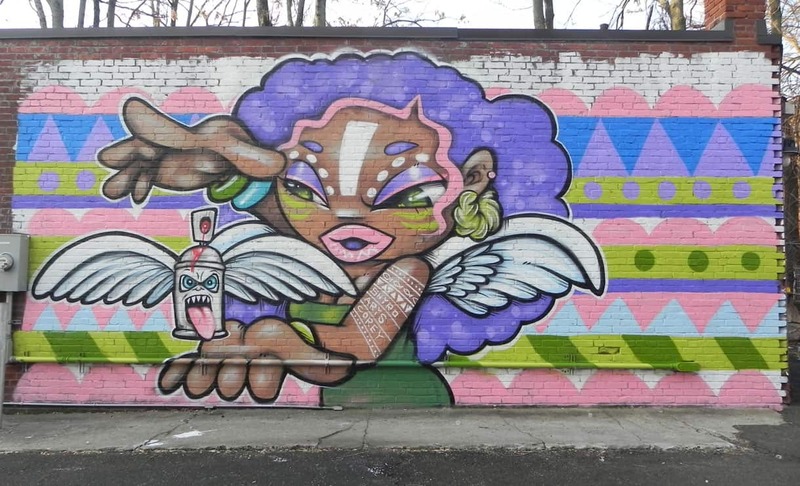 At the Unique Hair Salon, located on the corner of Broad Street and Park Street, Shiro One (Japan), with assistance from Hartford graffiti writers Lindaluz Carillo and Corey Pane, created a massive piece on a side wall of the salon. 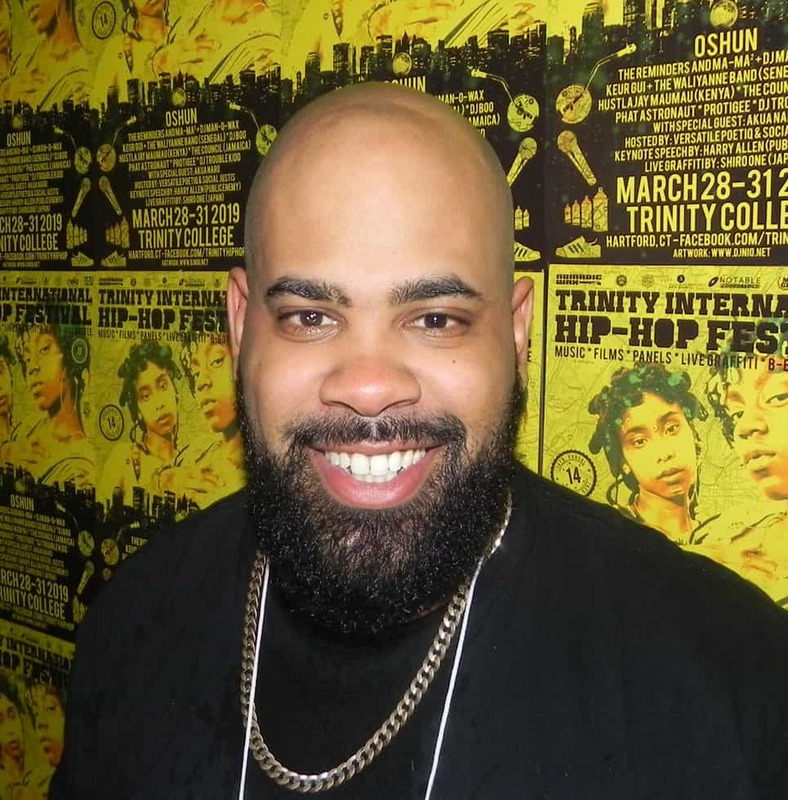 Back on the Trinity campus, a large crowd attended the DJ and Producer Showcase starring award-winning hip hop pioneer DJ Tony Crush of the legendary Cold Crush Brothers, who opened with a set of class mixes with beats suitable for breakin’ and rapping. A panel of esteemed, production-battle winning artists included G-Whiz, G-Dot, V-Notes, Miss Madli, Pup, Ghazi Omair, and DJ Stealth, most of whom hail from the Greater Hartford area. This event included a call and response exercise and a soundcheck for the four computers and one DJ mixer with 2 turntables, all routed through a large mixing board provided by the lead producer and designer of beat challenges, G-Whiz. Each producer was given a wireless mic and asked to introduce another producer from the perspective of a peer, followed by rounds of beat-making in real time. “The crowd nodded their heads to the infectious rhythms,” said organizer and host Khaiim Kelly ’03. “The audience went crazy for each of the five rounds. 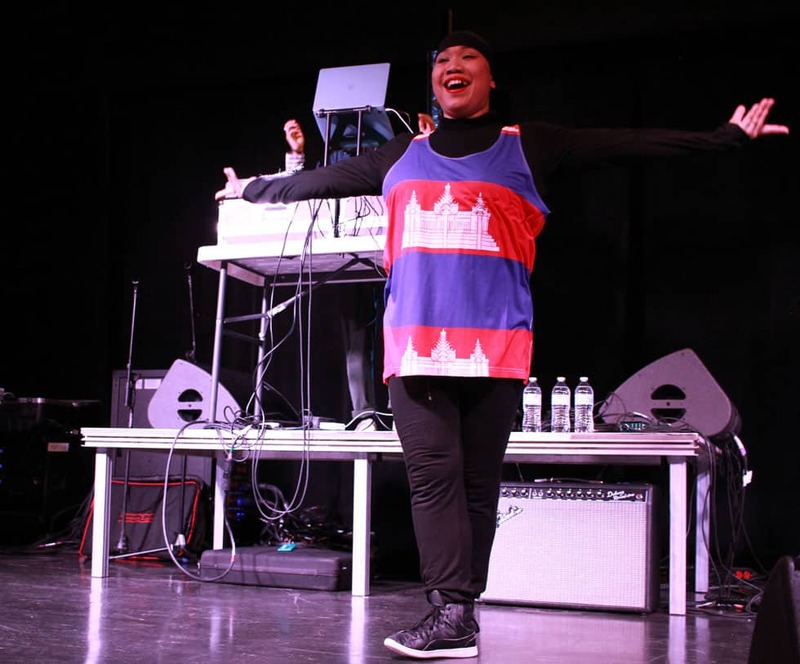 And the multiracial panel of men and women producers fired off original beats in response to specific challenges.” In honor of international hip hop, the event concluded with the DJs making beats by sampling music from outside of the United States. The Iron Poet Challenge and Annual Championship marked the last event of the festival. Hosted once again by Versatile Poetiq, the event featured performances by Puertominicana and spoken word artist Deneka Thomas (Trinidad & Tobago). 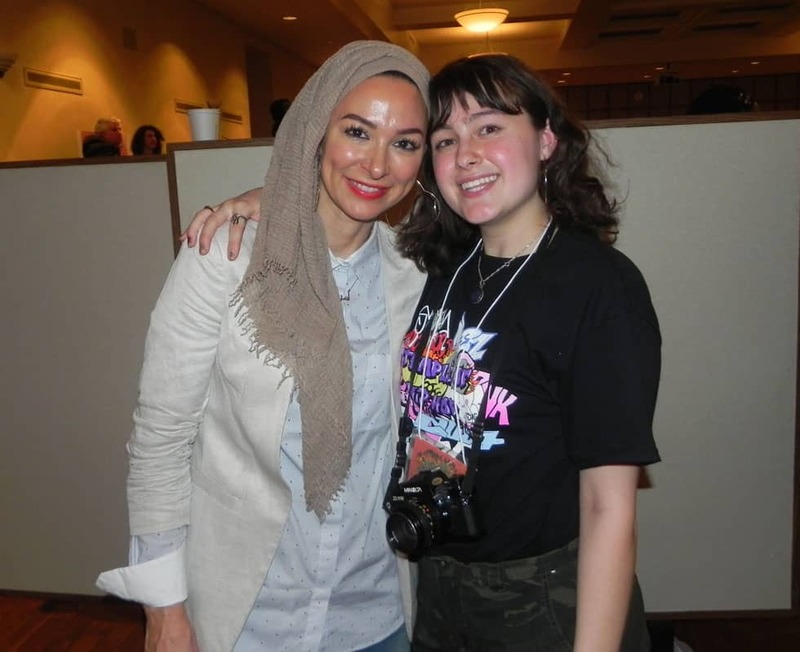 Ten spoken word poets, including Trinity students Silvia Nunez ’21, Isabel Exstein ’19, Hannah Grosberg ’19, and Jederick Estrella ’22, competed. The esteemed judges—Deem Malik (Hartford), Zulynette Morales (Hartford), Carol Correa de Best IDP ’01, and Deneka Thomas (Trinidad & Tobago)—crowned Sadejah Blake (UCONN ’20) the 2019 champion. Jederick Estrella ’22 finished in second place. A special thanks to our co-organizers Greg Schick of Nomadic Wax, Khaiim “Self Suffice” Kelly ’03, Taris “Machinegun Poptart” Clemmons, Brittana “Versatile Poetiq” Tatum, Lindaluz Carrillo, and Jasmin Agosto ’10 for doing such a wonderful job. 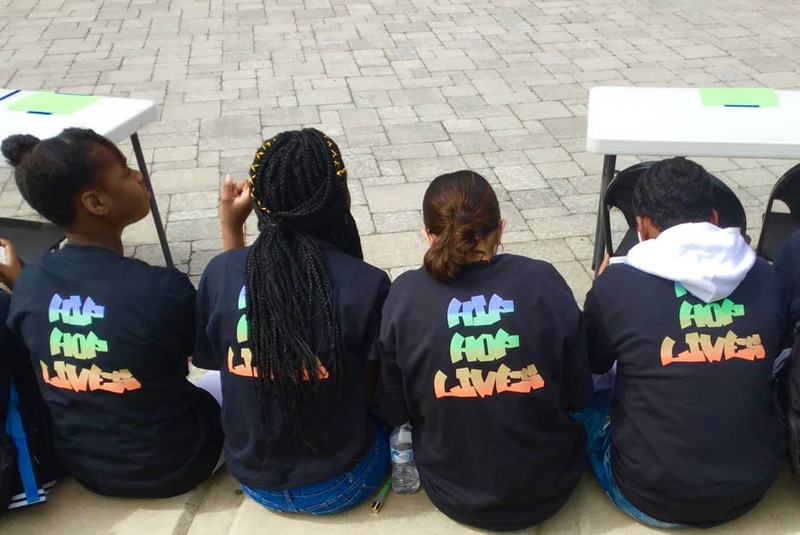 Also, the Trinity Chapter of Temple of Hip Hop (Karen Navarrete ’20, Selina Ortiz ’19, Giana Moreno ’20, Kabelo Motsoeneng ’20, Rafael Szachilowski ’19, Cody Maldonado ’20, Renita Washington ’22, Joli Smith ’22, and Wendy Salto ’22) would like to thank President Joanne Berger-Sweeney, Anita Davis and Carol Correa de Best IDP ’01 of the Office of Multicultural Affairs, Mark Hughes of Corporate & Foundations Relations, Carol Kessel of the Comptroller’s Office, Rebecca Pappas of the Theater and Dance Department, Summer Tate (HMTCA), Zenab Elzein (Impact Academy), Garth Adams (Hartford Youth Scholars), as well as Buildings and Grounds, the Center for Urban and Global Studies, Communications Office, History Department, Human Rights Studies Program, and International Studies Program for their support. This year’s festival was also supported in part by the Greater Hartford Arts Council’s United Arts Campaign with major support from the Hartford Foundation for Public Giving and funded in part by the Expeditions program of the New England Foundation for the Arts, made possible with funding from the National Endowment for the Arts, with additional support from the six New England state arts agencies. Panel: "Listening While Muslim" with Aja Black and Samir X of The ReMINDers and B-Girl Ma-Ma. Photo by Greg Schick. Students perform during the Trinity ’Til Infinity 2.0 Battle Zone. Photo by Eric Zhang ’22. The Friday night dance battle. Photo by Greg Schick. 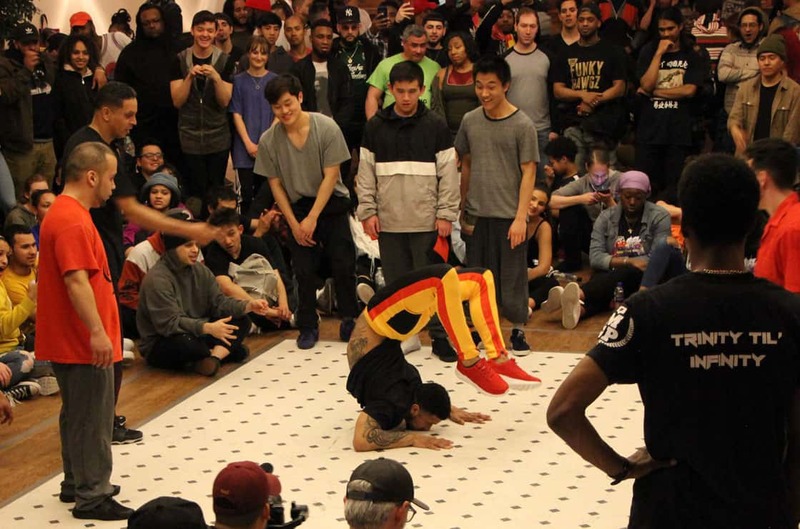 Trinity 'Til Infinity 2.0: All Styles judges table. Photo by Greg Schick. Saturday's live graffiti exhibition on the Gates Quad with Shiro One. Photo by KalaLea. Lee Mixashawn Rozie IDP ’12 displays an uncanny mastery of circular breathing as he plays the saxophone. Photo by Greg Schick. Youth 4 Change Conference: Hartford Youth Scholars participants enjoy a graffiti workshop with Shiro One. Photo by Seth Markle. Hartford Youth Scholars at the Youth 4 Change Conference on the Cave Patio. Photo by Seth Markle. B-Girl Ma-Ma performs during the Main Concert. Photo by KalaLea. Zee Santiago ’09 was happy to be back on campus for the Hip Hop festival. Photo by Seth Markle. The ReMINDers and Ma-Ma2 perform at the Main Concert. Photo by Greg Schick. Headliners OSHUN. Photo by KalaLea. Amirah Sackett and Giana Moreno ’20. Photo by Seth Markle. T-shirt design. Photo by KalaLea. Japanese artist Shiro One, with assistance from Hartford graffiti writers Lindaluz Carillo and Corey Pane, created this piece on a side wall of the Unique Hair Salon building at the corner of Broad and Park Streets. Photo by Seth Markle.